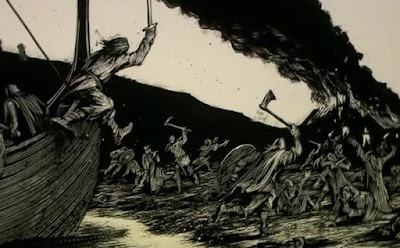 Viking history : 1060 - Harald Hardrada started to plunder Denmark again. 1060 - Harald Hardrada started to plunder Denmark again. The large ship Ormen (The Serpent) was built for Harald Hardråde as a busseskip (a big, broad ship) with a gilded dragon’s head at the bow stem and a hook-shaped stern stem. Harald Hardrada began to plunder Denmark again. Denmark was split into 8 clerical units: Vendsyssel with Thy, Odense ,Viborg, Roskilde, Ribe, Aarhus, Lund and Dalby. Dalby was soon canceled and put under Lund. Sweyn II Estridsson received a papal letter in which he was obliged to pay peters money to the Vatican church and Anno Domini became the official time stamping which were used in official documents. The catholic church gained influence, their influence changed vigilante affirmative action and collective punishment, it became possible to pay a fine if you had done a murder. If a man became judged lawless only the king could lift the ban, this increased the monopoly of violence to the state(King). William the Conqueror could relax he became stronger, both his enemies King Henry of France and count Geoffrey died. In May The Normans under leadership of Robert Guiscard conquered Taranto. A Sicilian Emir of Syracuse, Ibn al-Timnah, arrived at Reggio to secure the help from Normans against his rival emir, Ibn al-Hawas. He promised that, in return al-Timnah would acknowledge their claim over Sicily. Christian rune church inscription at Fyn Ørsted Church "Samson kills Lion"
Stenkil Rangvaldson became king of Sweden he ruled until 1066. 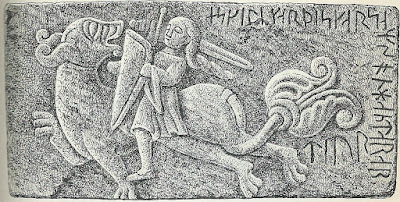 The last of the Uppsala dynasty Emund died, Stenkil came from Western Gotaland, and he created a bishopric among the Swedes in Sigtuna. 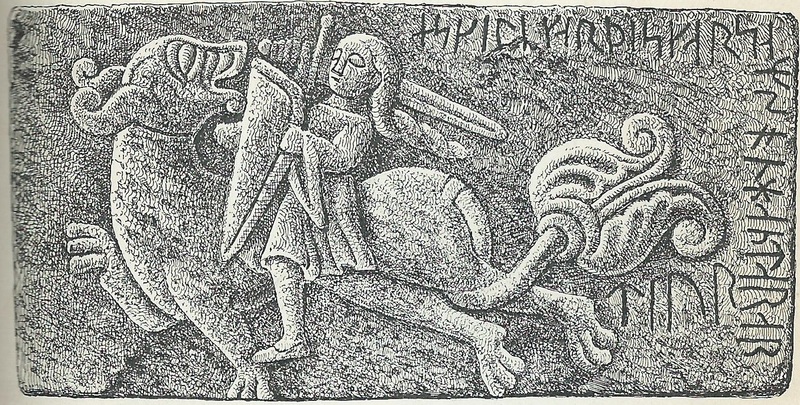 Later the bishop was driven out, a strong pagan culture was still strong in Uppland.